Dear lord! At a first sight I thought that you do also have records in the toilet… you knew that our common friend Bruno Dorella keeps cassettes in the kitchen? I’m often asking to the Concrete Shelves contributors where and how they like to listen to music, especially when they listen to harsh or extreme stuff. You’re (never) known as one of the most representative dark ambient/isolationist artist in Italy. Where do you listen to such music in your house? 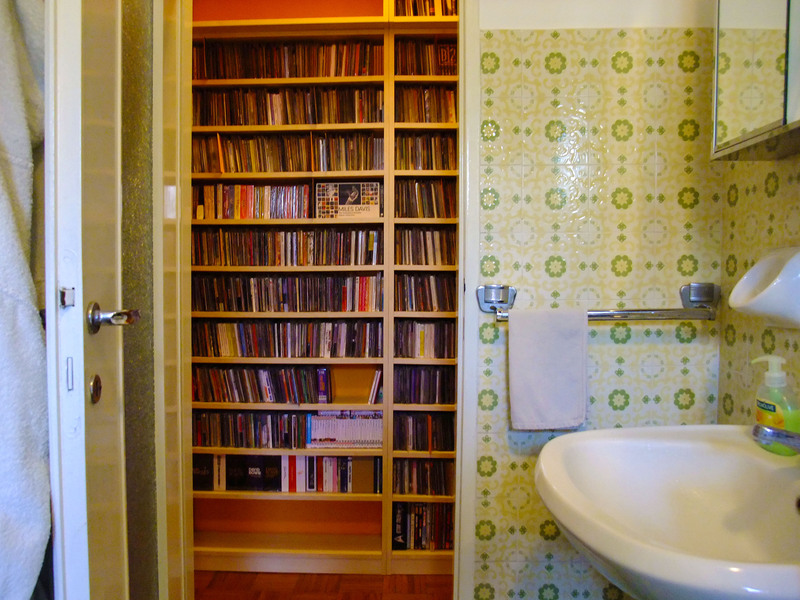 Well, the toilet is the only place in the house that still has room for more shelves, unfortunately records wouldn’t survive humidity for very long… Cassettes in the kitchen are a cool idea, Bruno knows his stuff. I keep a portable CD player equipped with a Bose Soundlink on the fridge because I enjoy listening to Reggae and Pop music when I cook; Gainsbourg‘s late ’70s / early ’80s Reggae albums are on heavy rotation since months. I usually listen to Ambient / Drone music on the couch in the living room during the evening; my fiancée and me often fall asleep listening to quiet and relaxing CDs. Recently we enjoyed a few old Mathias Grassow works and the latest Lino Capra Vaccina album. A dismantled PC, an oversized cassette (what is that? 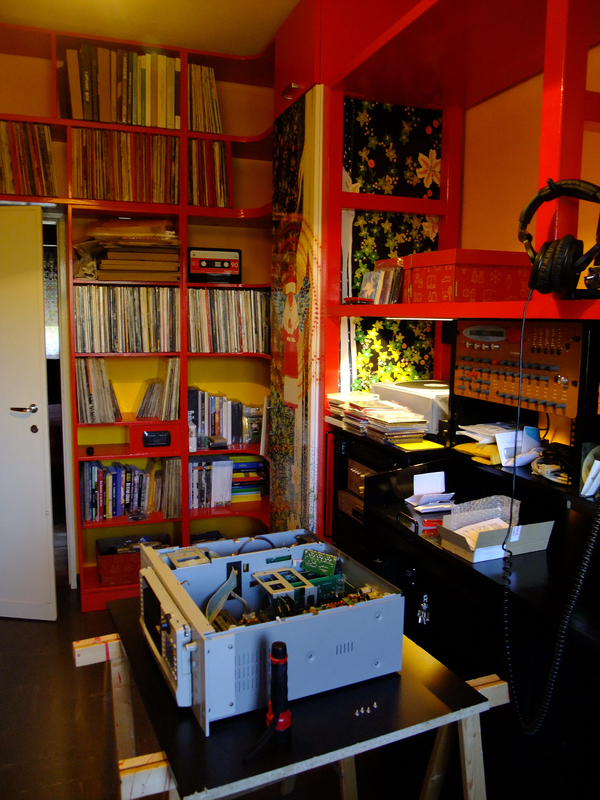 ), black and red stylish shelves… your house really looks like the dungeon of a very-well-organised Milanese music lover. How did you get that stuff with also the cat’s illustrations? Actually the dismantled PC is an Akai S6000 sampler: I’m the process of re-building my music studio and the room is a mess at the moment… The sampler is open because I recently replaced its old SCSI hard disk with a device that uses MicroSD cards via the SCSI bus. This solution is marvelous but I need a longer cable, I ordered it yesterday and I will hopefully receive it soon. The ‘oversized cassette’ is just a metal box that I use for small parts, screws, bolts and so on. I built most of the shelves shown in the pictures by myself. The black ones are an exception because they are just heavily modified ‘Billys’ from the Ikea catalogue, it seemed the best option at the time. The small panels with cats silouhettes are an additional personal touch: I love cats, so I just googled for useful images and had them printed on very thick red cardboard, et voilà! I am a neat person so I try to organise all my activities as best as I can. 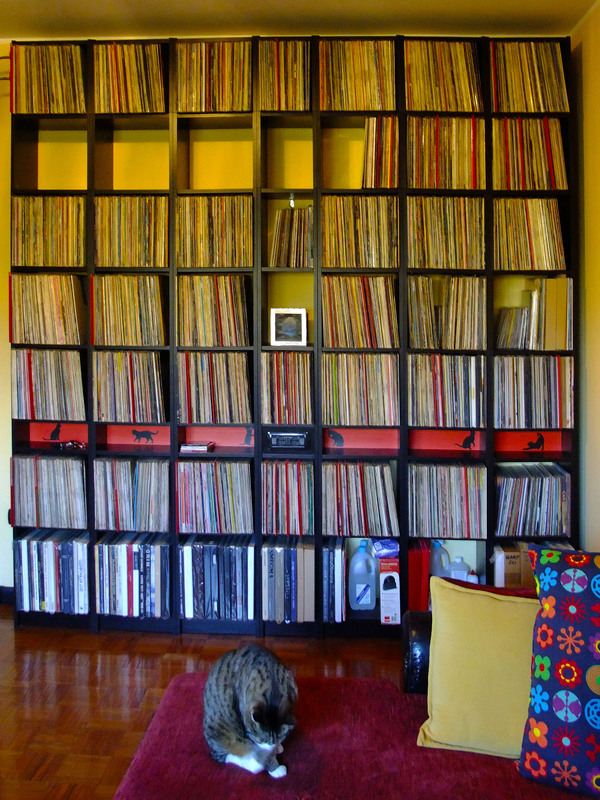 In particular, when you own a large collection of music, there is a concrete risk that you’ll end up losing track of a particular LP or CD, so the more you keep your records organized, the better. Usually I can easily find what I’m looking for in the house, but sometimes a record gets archived in the wrong place and it virtually disappears… I used to have an original vinyl copy of Leo Anibaldi‘s “Muta” double album but I can’t find it, no matter how hard I try… I still have hundreds of LPs at my father’s place, probably it is hiding somewhere among them or maybe I gave it away to a friend and I don’t remember about it, I dunno… Anyway, at the moment this is the only one ‘lost’ record in my collection, so I guess I can say that my method almost works… I keep a database of the LPs and CDs that I own, and as soon as a new record enters the house my very first concern is to add it to the list, even before opening it or listening to it. When I go to second hand records shops or flea markets I often happen to purchase records that I already own… On the contrary, sometimes I decide to not purchase an album because I’m 100% sure that I already own a copy, only to discover that I was wrong as soon as I am home… Of course my memory can’t compete with a database. And by the Japanese records in pink and yellow. What’s that stuff? It’s like the Japanoise of Paolo Bandera? No, I’m afraid they don’t share any similarities with Japanoise or other forms of extreme music… OK, brace yourself for this: since a few years I developed a strong interest in Asian Pop music from the ’60s and ’70s; in particular, the CDs that you mention are re-issues of Mandarin Pop albums by Pancy Lau (水長流) and Betty Chung (鍾玲玲), both from Hong Kong. Well, Yan Jun also sent me a photo with his cat, Lailai (attach)! He said that the cat likes no music. How’s named yours and what does he listen to? Our cat is named Scheggia, or better, Skeggia with a ‘k’ instead of ‘ch’, and is an eleven years old male. In Italian his name literally means ‘splinter’ or ‘sliver’, but in a figurative way it also means that he is ‘fast as lightning’. He usually doesn’t dislike any kind of music as long as the volume is not excessive and the high frequencies in the mix are not of a disturbing nature. He often joins me in the studio room for hours and music is part of everyday life for both of us. Andrea Marutti (Savona, 1970) is an Italian experimental musician. Among his projects and collaborations we remember Amon, Never Known, Hall of Mirrors and Sil Muir. For many years he has run Afe Records, a label dedicated to all forms of experimental electronic music.